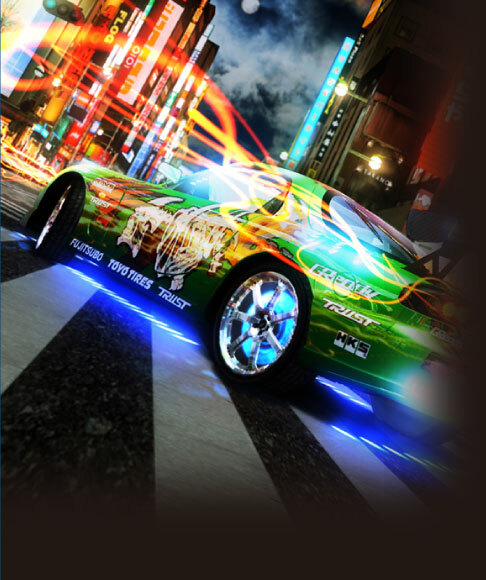 Sega has updated the official Japanese website for R-Tuned: Ultimate Street Racing, adding some screenshots, a couple of short video clips and information on how the game is played. Amusingly, the cabinet lighting changes through seven colours according to what is happening on screen and the bass beat. The game features 16 courses, set in the Shibuya and Shinjuku districts of Tokyo as well as Hong Kong and New York, which have apparently been accurately reproduced. The game appears to be quite heavy on drifting and boosting and looks to have captured the sensation of speed well, but the screenshots suggest that each race is contested by just four cars. The game features a cameo from Sonic the Hedgehog, with the spiky blue bushpig appearing on the livery of a particular car. All very good, of course, but I’m hankering after a Rambo website update. After all, we’ve been talking about it for what seems like an age now, and it’s been two months since I went and played the thing at a location test! But no, infuriatingly the site remains nothing more than a “coming soon” message. Anyhow, enough of my ranting – you should check the R-Tuned site out for yourselves, which you can do at the link below. It is strange that Rambo hasn’t been updated yet, seeing how it is supposed to come out in September and R-tuned comes out in December. I secretly hope that this is the last racer we’ll see for a while but I doubt that such a thing will happen.